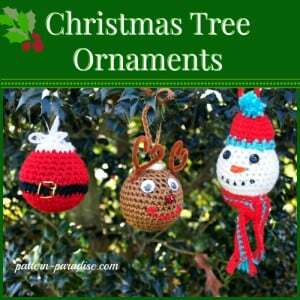 Use up your yarn scraps and decorate your Christmas tree with these adorable ornaments. Add a little glue and a little glitter and let the celebrations begin! 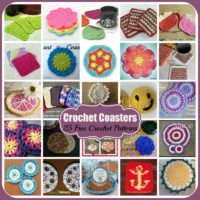 The glue will also help to keep them in the desired shapes, making it easy to store and re-use them year after year. 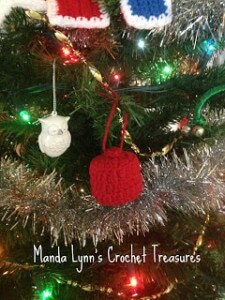 With only two colors of a bulky yarn you can whip up these adorable ornaments in no time at all. 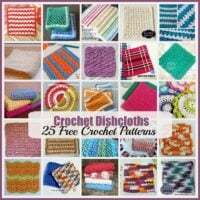 Use up your scraps and make them in all kinds of colors or work off a few new skeins and crochet a bunch to match. 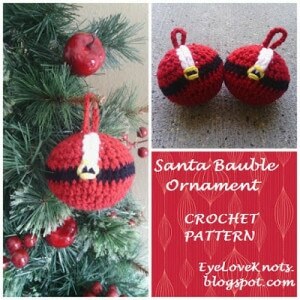 I love the adorable Santa suit portrayed in these adorable ornaments. 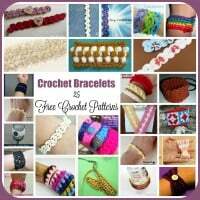 They will add a nice touch of handmade to the tree, or to any gift basket. 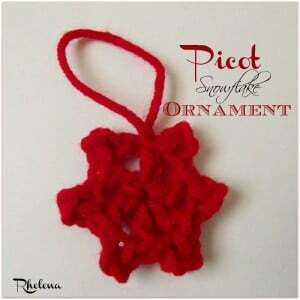 This is an adorable snowflake ornament that can be crocheted with only a tiny amount of yarn. 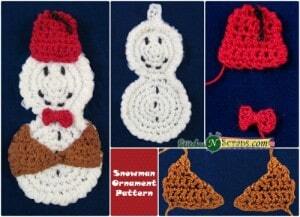 This festive collection includes a Santa, a Reindeer and an adorable snowman. 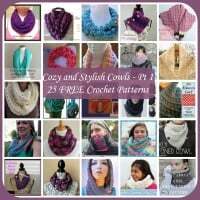 Crochet one, or crochet all three and enjoy the compliments. 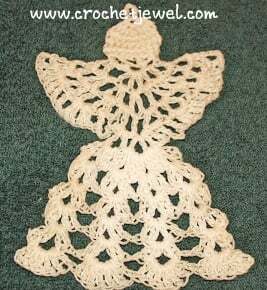 This pattern page includes instructions on how to crochet this adorable angel as well as a cool icicle. 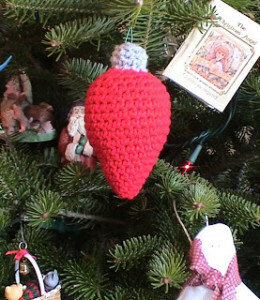 This is simple and perfect for any tree. It might also look lovely as a gift topper. This adorable ornament is sure to be a hit with small children. And you can also use him as an applique. 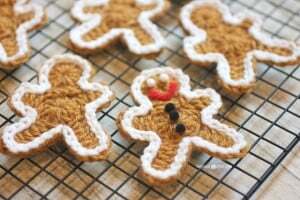 This delicious gingerbread man is perfect for the tree or as an applique. And kids will love playing with the delicious treat as well. 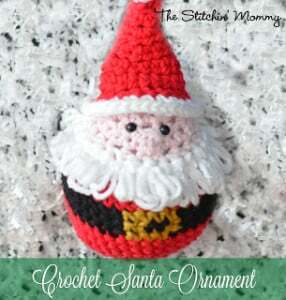 This adorable Santa is a must-have for your tree or for your child’s toy collection. The beard somehow makes him come to life. The adorable face is sure to bring a smile to both young and young at heart. And I love that hat and scarf… it makes him look so cozy. 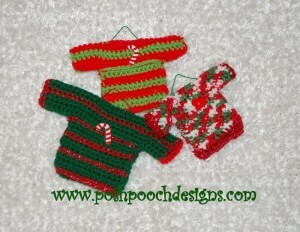 I love the looks of these adorable sweaters. 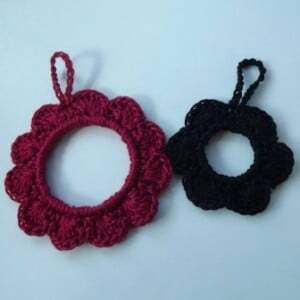 Hang them on the tree, or string them into a bunting for a cool and festive decoration. 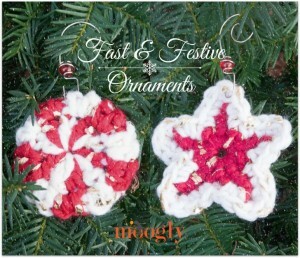 Re-decorate any of your old ornaments with this festive cover. You only need small amount of scraps to whip this up. Every tree needs a snowflake, and this is it. Dab it with glue and glitter and shape it so it’ll hold it’s shape for year after year. 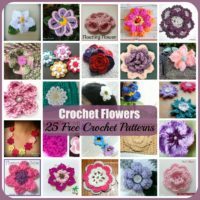 This is too adorable not to crochet. 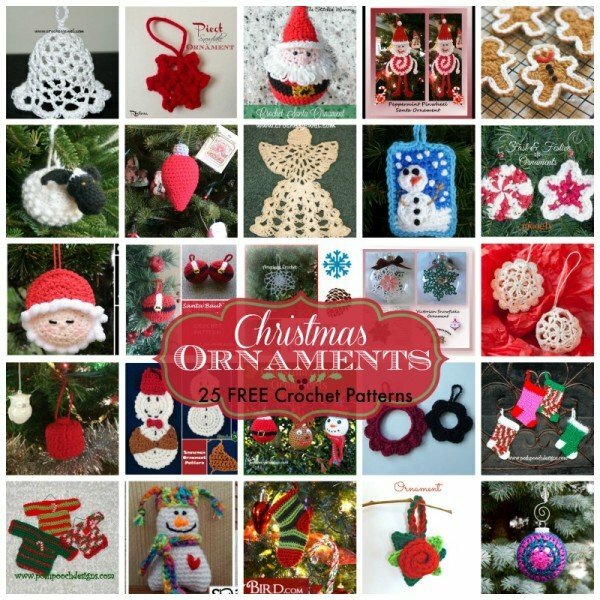 It looks lovely as shown on the tree, but why not string them into a banner for the fireplace? I think it would be super cute … and festive! 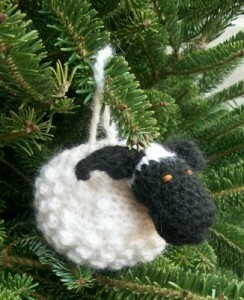 This adorable sheep makes for a cute Christmas ornament or for an everyday toy for the small children. I love the peppermint candy for the belly of this ornament. 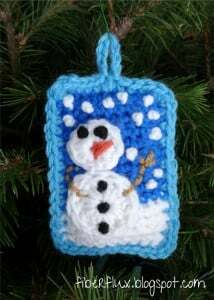 He looks mighty cute on the tree, but you might also enjoy this as a holiday bookmark. 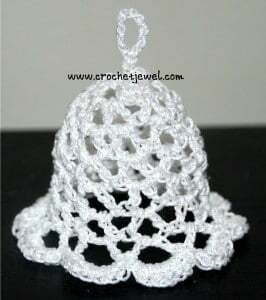 I love the pretty lace in this Christmas bell. 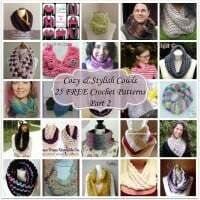 The free pattern comes with a video tutorial so everyone can crochet this festive beauty. 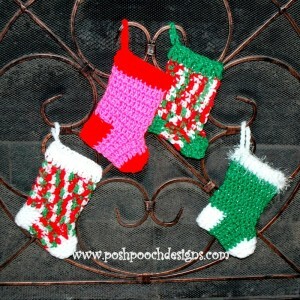 The beauty of this stocking is that you can use it as a mini gift bag, or hang it from the tree. This is the cutest snowman ever! 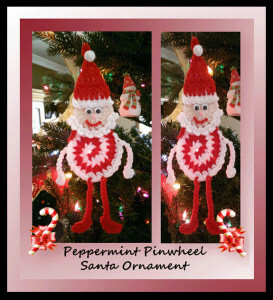 He looks great on the tree, but you could also try using him as a cute applique on a bag or scarf. 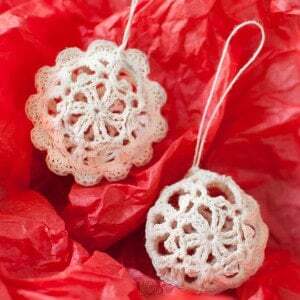 I love the open lace on these ornaments. It somehow makes the ornaments look more festive. They are covered in glue and then dried over a balloon in order for them to maintain their shape. And you can leave the glue plain or add some glitter for a more festive look. How cool is this? It’s a cute Santa pocket to hold your gifts of money or other small items. 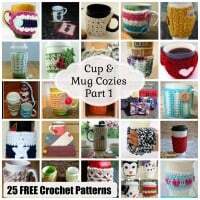 It’s definitely worth the crochet! Every tree needs one of these. It’s festive and sure to be appreciated year after year. 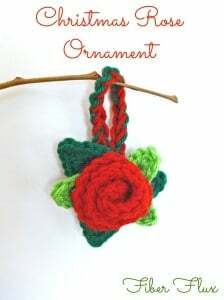 This beautiful rose ornament has many uses. 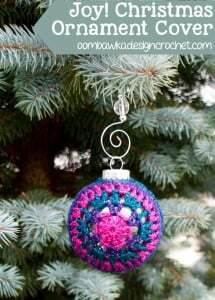 The tree is one, but I’d love this on my bag or on my keychain as well. Plus, you can use it throughout the year! 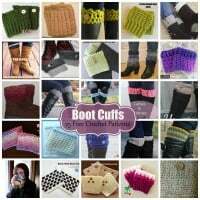 These adorable stockings measures 5 by 6.5 inches. 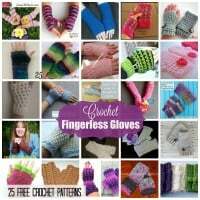 Thus, they are the perfect size for candy bags for the children. This flower may not be very Christmasy, but in the right colors and a bit of glue and glitter you could make this work for any tree. Plus, you could use it as a cute photo frame for the tree. 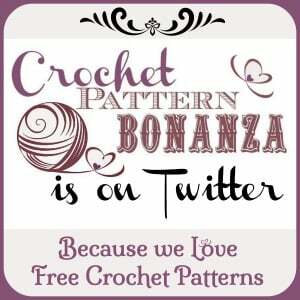 And if you enjoyed this roundup, you might also enjoy more free crochet patterns for Christmas Ornaments on Crochet Pattern Bonanza. 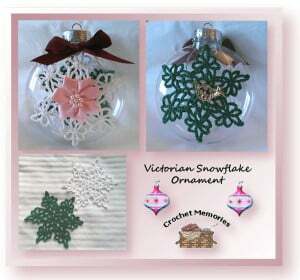 Love the Christmas ornament patterns and haven’t been able to find any books on them in the stores.